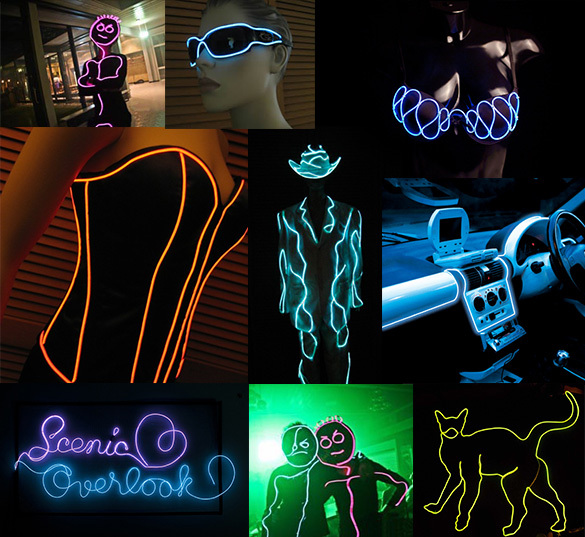 Steal the show at your next party with the EL (Electro Luminescent) wire from LED Montreal. Light up your stage or Halloween costume with this cool gadget. The EL wire features 3 modes, always on, slow flash and fast flash. Spanning from 1m to 10 meters long and 2.3mm or 5mm thick, the EL wire is offered in 7 colors: red, white, blue, orange, lime green, dark green and pink. For full portability the EL Wire can be powered by a battery pack of 2XAA batteries or 8XAA for extended usage or longer sections (Note that the batteries are not included). The battery pack may make a slight hissing noise when in use. This is due to the DC inverter and rest assured that the product is safe for the user. The El wire can also be connected to a standard 120V outlet with the power adapter kit should you wish to use it for a permanent display.